If you want to book any intensive course, you can do it here. 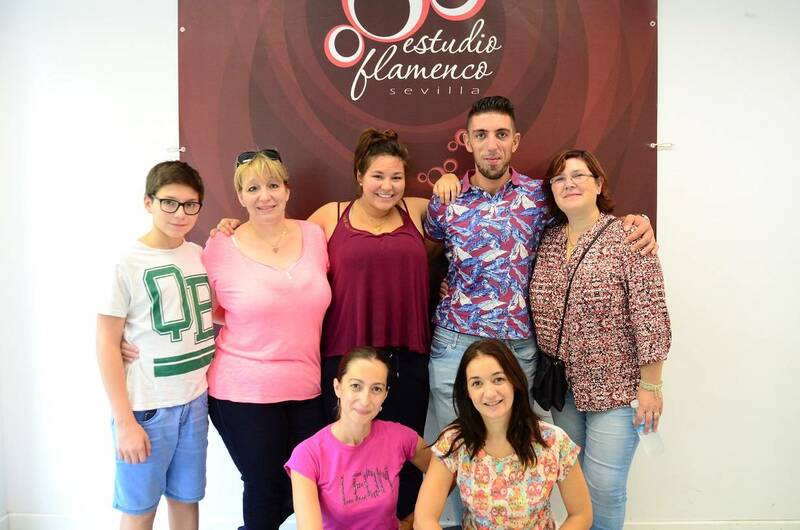 These Flamenco courses are aimed at a single student or a small group. If you are a large group I recommend that you read esta información. They are individualized classes in which the interests and needs of the students are particularly important. They are designed to adapt to the students’ hourly needs, the subject they choose and their level of knowledge. Dancing, singing, guitar, and percussion. 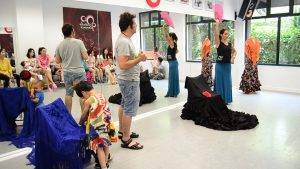 You can also choose between theory of Flamenco, understanding the structures and singing of the different styles of Flamenco, rhythm and claps, Sevillanas, technique, choreography, castanets, the use of accessories (dress tails, shawl, Flamenco fan, Cordoban hat …). The reason for organizing this type of course is usually due to the student’s lack of time. There are also students who cannot adapt to a regular class schedule. Sometimes they need to learn something very specific or have more difficulty learning in a group and need more personalized attention. Normally our students come to our school for short periods of time and want to take advantage of their stay with us to the fullest. 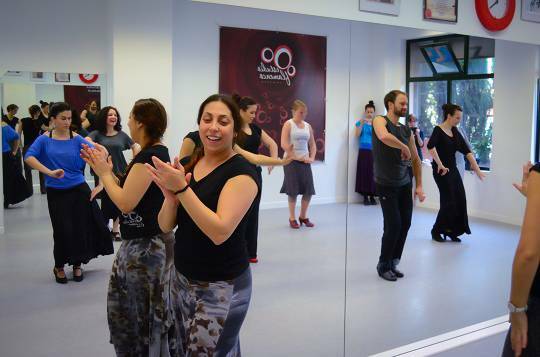 The Flamenco courses most requested by our students are: First contact with Flamenco, Flamenco weekend, Choreography, Sevillanas, Singing, Guitar and Percussion. It offers you a deeper knowledge of Flamenco. We will guide you in the Flamenco culture and initiate you in its most basic techniques and rhythm. You can get a general idea of Flamenco. First, you will discover what Flamenco shoes are. How they are used, the types of taps or stamps that exist and the teacher will give you a live demonstration. Later you will be able to see all the accessories that are used in Flamenco, how they are placed and for what kind of dances they are used. Among these accessories, you will see the Cordoban hat, the combs, the castanets, the Flamenco fan, the shawl, the dress tail, the traditional Flamenco dress, the flowers and the earrings. Then we will develop rhythm exercises, mainly Tangos and Rumbas. We will also make foot taps and without using special footwear. We will move arms, hands and hips to the rhythm of the music. And at the end of the class, we will create a small choreography that will make your first experience fun and unforgettable. 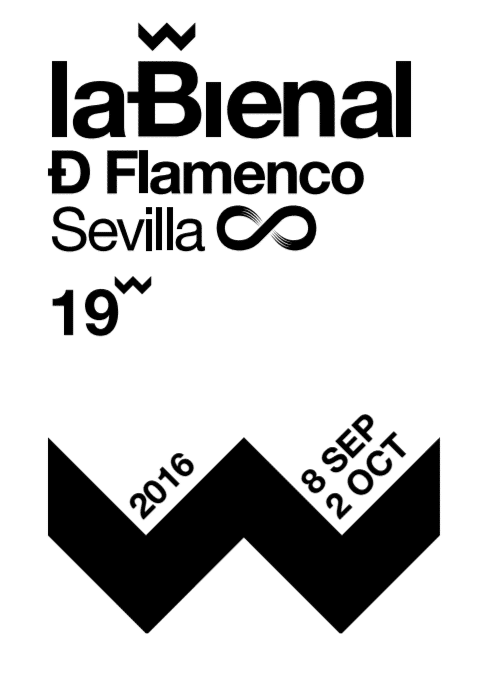 So now you know, do not miss this opportunity to know the Flamenco from the best professionals. All this information is shared with the student, who is able to make contact and participate in every part. If your personal and work commitments do not leave you with time for leisure activities, or you are far from our city, we can work with you on the weekend. 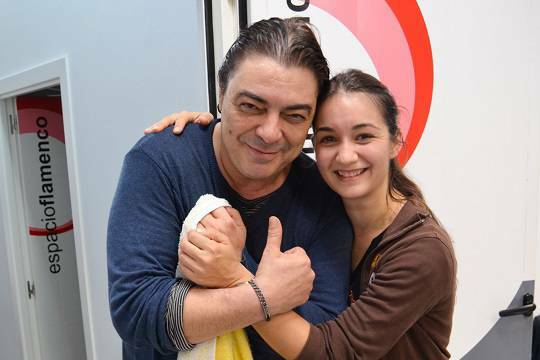 We can use Fridays, Saturdays and Sundays to train you in the Flamenco discipline, in addition to assisting with tourism and Flamenco shows in our city. In cases of one individual, we recommend a maximum of two hours per day. In the case of a group, three hours per day. In this time you will get a general idea of ​​what you can work on later. We can work on technique, choreography, the use of accessories, the theory and history of Flamenco, rhythm and clapping, guitar, singing and percussion. If you need to work on stages, in schools or just for fun, this is your course. 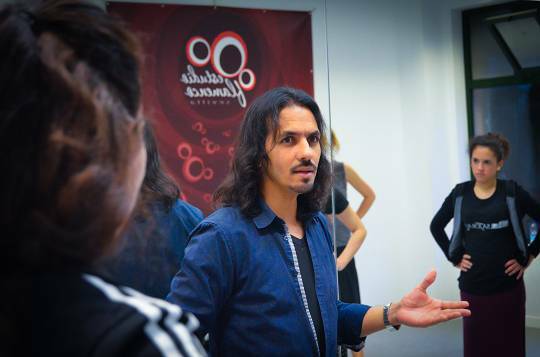 This Flamenco course is aimed at any type of student or group of students. You do not need a certain level, we adapt to your knowledge. There are two ways to choreograph: choosing the music of any Flamenco Palo, or in a traditional way, with guitar and live singing. The teachers will adapt to your level of knowledge and your needs. You will receive explanations of the rhythm, the technique and the different structures of the Flamenco Palos. When you finish the course you will be able to take the recording of what you have learned. There are students of all kinds, teachers from other schools that need choreography; dancers who need to start choreography to begin work in the artistic world; groups that need a specific choreography for a performance; brides who want choreography to surprise her partner at their wedding, and students who simply want to learn a specific choreography. 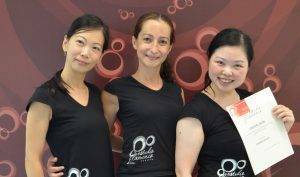 Our experience teaches us that in 7 hours of class, you will learn the basic steps and coordinate them with arm movements. You will get a good base so that later you can practice. For a complete teaching it is highly recommended to intersperse the face-to-face classes with the online courses. We provide you with the link of our online Sevillanas course. The online course supports your learning. La Sevillana is a folk song that has been transformed into Flamenco and comes from the Seguiriya. Currently they are very popular, being danced in every fair, pilgrimage and celebration. It is a dance for couples and is composed of four couplets or four parts, which are called first-second-third and fourth. Each part of the Sevillana has a fixed choreography divided into three different parts. In all of them the beginning (paseíllo) and the end (return) are repeated and also the last (used to join one part with another and cross with your partner). Its rhythm is simple, of ¾, three times in which the first one is accentuated and its theme tends to be an expression of the Andalusian, and in particular, of the Sevillian. There are several styles; Rocieras, Fair, Corraleras, Liturgical, Boleras etc, and it is usually accompanied by claps and/or castanets. We offer intensive and personalized courses of singing, guitar and percussion. With regard to singing, you can learn all styles and Palos of Flamenco: Bulerías, Tangos, Alegrías … your favorite Palo, its rhythm and tonality. Come to play the Flamenco guitar – exercises, improvised licks, chords, solo, for singing or for dancing. The teacher will indicate the correct posture for the use of the instrument and will give you guidelines for correct practice. The Flamenco percussion box has been a revolutionary instrument for Flamenco music in recent decades. Learn the techniques and enjoy playing. 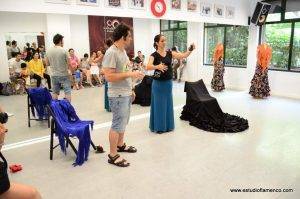 In these classes you will learn the position and placement of the body, hands and fingers, and you will receive explanations on the rhythmic basis of the different Flamenco Palos. Continued practice will take you towards the learning of the instrument. The student chooses the duration of the course and the schedule, the subject to choose and the level of knowledge. The teacher offers his knowledge and will advise on exercises for better learning and practice. We recommend a maximum of two hours per day. 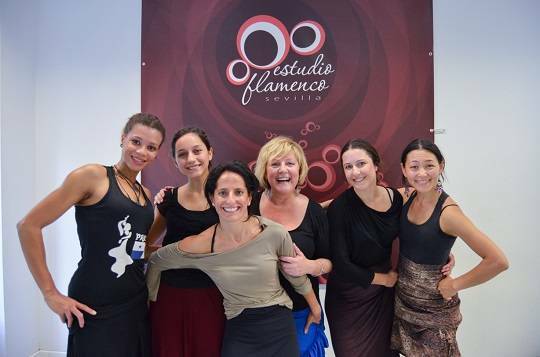 These Flamenco courses are scheduled for special dates. When a course of this type is scheduled, we will publish it directly in our menu of Flamenco face-to-face courses. We will describe all these courses and how they are organized. La Feria de Sevilla es una fiesta muy esperada por todos los sevillanos. Es visitada por público de todo el mundo, conocida por su ambiente festero, sus casetas, sus coches de caballos, su bebida típica “Rebujito” (mezcla de vino manzanilla con refresco carbonatado de Lima limón), su calle del infierno (atracciones, tómbolas…) y sobre todo por su baile por sevillanas. Las sevillanas son un cante y baile andaluz típicos de Sevilla y otras provincias de Andalucía, que se cantan y se bailan en las distintas ferias que se celebran por parte de la comunidad andaluza, sobre todo en la Feria de Abril de Sevilla. The Fair of Seville is a party much awaited by all Sevillians. It is visited by people from all over the world, known for its festive atmosphere, its tents, its horse carriages, its typical drink “Rebujito” (a mix of chamomile wine with a carbonated soft drink of lemon and lime), its “Street of Hell” with its rides and attractions and especially for the dancing of Sevillanas. Sevillanas are a typical Andalusian song and dance of Seville and other provinces of Andalusia, which are sung and danced in the different fairs that are celebrated by the Andalusian community, especially in the Feria de Abril in Seville. It is part of Andalusian folklore. Currently, it is the most danced regional dance in Spain and abroad. Sevillanas are usually danced by couples to the sound of the four couplets in which the Sevillana is divided. We usually organize intensive initiation courses for the Sevillanas. We also have improvement classes for students who already know how to dance them. These courses are usually held on weekends. However, we have Sevillanas groups during the annual course. We adorn our school with “lanterns” typical of the April fair. At the end of these courses, we hold a private party for the students of the school where coexistence, fun, singing and dancing are the order of the day. 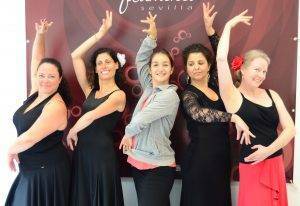 Flamenco courses taught in July and August. We always try to offer a wide range in terms of time options. The regular students of the school that stay in these summer months are becoming more and more numerous. Therefore, we are able to offer more regularity in terms of group classes. In addition, there are also new groups of beginner students who, having more free time in summer, decide to start a new hobby. 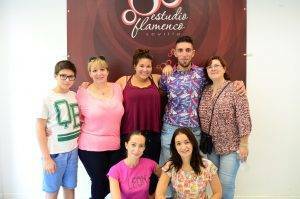 Also growing is the number of students from other countries who decide to spend their holidays enjoying Flamenco and we plan intensive courses during their stay with us. It is definitely different period from the annual course in that there is more diversity in terms of the students, and the coexistence in the school is very rewarding. 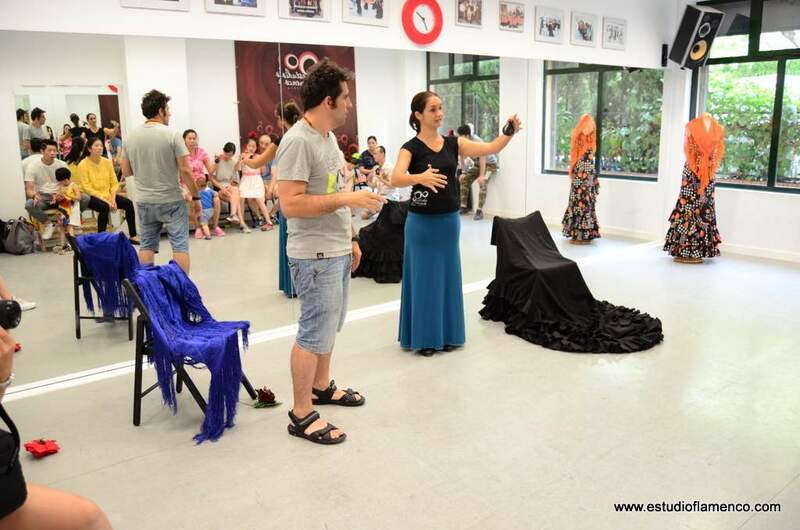 What most attracts the public during the summer months, and is what we offer, are Flamenco dance technique classes, Bulerías, Rumba improvisation and weekly courses that are usually of technique and several choreographies. Our studio is equipped with a ventilation system adapted to alleviate these temperatures and, of course, air conditioning. You will be better inside our school than outside. I encourage you to dance Flamenco in summer, heat is no excuse. 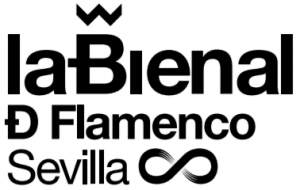 The Bienal is the Flamenco world’s great international event. Every two years, Seville becomes a great showcase to which fans and professionals in the sector from all over the world turn their eyes. The main scenic spaces of the city are used for the festival. For several weeks the most anticipated releases, the art of the main artists and the proposals of the young talents are offered. Since its birth in 1980, the Biennial has celebrated 19 events for more than three decades. In this time, the show has created all kinds of proposals and trends. They represent all the aesthetics, colors and perspectives that Flamenco art has. It is a great cultural space where traditional Flamenco coexists in harmony with the most experimental, risky and avant-garde Flamenco. During these dates our school prepares to receive new students. They come from countries around the world for the Festival, students who love Flamenco, amateurs and professionals. To do this, we expand our range of possibilities by offering a wide variety of Flamenco courses, weekly and weekend, with famous artists, and more specific options. Our school is open to any suggestions from students and tries to carry them out. Our commitment to teaching and the love of Flamenco make our school a guarantee for your learning. Master class is defined as a class taught by a professional or expert in the field in which it deals with specific content. In the world of Flamenco and art, in addition to dealing with specific content in class, they are more focused on the style of the teacher. Every “bailaor”, guitarist or “cantaor” will transfer his technique, stage experience, tricks, his “pellizco” and his “aire” – in short, a part of him. 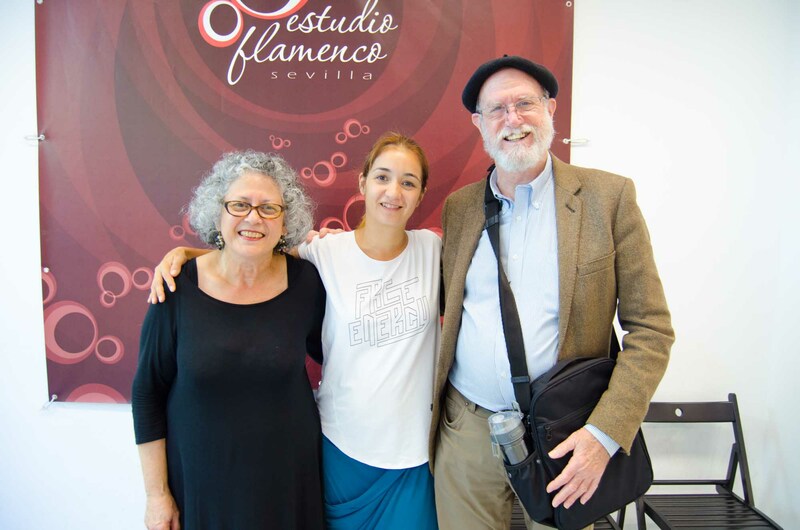 In Flamenco courses you can learn steps, but being short courses, you get more out of the observation of the style of the teacher and his techniques in teaching the class. Antonio Canales, Farruquito, Belén Maya, Pastora Galván, Mercedes Ruiz, El Grilo, Javier Barón, Fuensanta “La Moneta”, Soraya Clavijo, Francis Núñez, Jose Luis Rodríguez a la guitarra, Rocío Alcaide, Carmen Iniesta, Laura Santamaría, Jose Luis Medina, Juana Márquez, Lola Cano and our director Esther Vélez. These types of Flamenco courses have a variable duration. It can be a class of one hour in a single day, a weekend course, weekly courses or even for a whole month. Finally, prices are proposed by the professional who teaches the subject normally depending on their requirements and experience.